90' Nichols Brothers commercial vessel | Christian & Co. This inspection was performed upon the request of the client listed above, on October 5, 2010 while the vessel was afloat. Bilge: Holding moderate water, several compartments are “freshly” painted. Comments: The vessel was inspected while afloat. The hull bottom was not inspected. The hull sides and transom were visually inspected with the port side of the vessel towards the dock. The vessel was not spun during the survey. The hull sides and transom are in satisfactory – good structural and satisfactory cosmetic condition. The deck and superstructure were visually inspected. The deck and superstructure are in satisfactory – good structural and satisfactory cosmetic condition. The deck hardware including safety rails and mooring devices was visually inspected. Overall the deck hardware is in good condition. The structural reinforcements including longitudinal stringers, frames and bulkheads were visually inspected. The structural reinforcements appear to be in “as-built” condition. The bilge is holding nominal water in the steering and holding tank compartments. There is minimal water and trace oil in the engine room bilge. The interior of the vessel is neat, clean and orderly. The interior of the vessel is in satisfactory cosmetic condition. This survey is not a mould inspection. Many of the nuts for the bolts securing the windows are missing. There is no hailing port on the transom. There are scratches, typical of docking, on a port side forward window. There is no visible hull identification number (HIN). The tank access hatch, forward of the starboard generator, is missing 8 of 18 fasteners (or they are loose). The tool box in the engine room is not secured. There are loose buckets of oil in the engine room. The deck hatches for accessing below deck spaces are generally not secure. Access to a tank, in a bilge space forward of the galley, is open. This tank is not in use. The galley range is not secure and has no sea rails. The CO2 bottles for the beverage dispensing system are not secure in a locker to starboard forward of the main deck bar. There are cracks in several of the main deck windows forward. The steel cover for a crawl space to port forward on the flybridge is not secure. There are items stored on top of the pilot house, including tables. The tables are piled up to a height higher than the edge of the pilot house top. Comments: The engines and transmissions were visually inspected. The engines and transmissions were not test operated and the vessel was not taken on a sea trial. The external surfaces and peripheral components of the engines and transmissions appear satisfactory – good. There is corrosion on a water fitting on the top, port side of the starboard transmission. The engine controls were not tested. The exhaust system is properly arranged and installed. Both propeller shafts’ seals are leaking water. The steering system was visually inspected. The steering system was not tested. There is a water leak at the starboard rudder port and both rudder ports exhibit rust. The engine room blowers were not tested. There is soot starboard aft overhead in the engine room. The generators were visually inspected. They were not test operated. The generators appear satisfactory. There is oil about both generators, slightly more behind the port generator. The through hulls were visually inspected and a few of the valves were manipulated. The through hulls are in satisfactory – good condition. The seawater systems were visually inspected. Overall, the seawater systems are in satisfactory condition. There is rust and a water weep at the HVAC water pump, to starboard in the engine room. The electric bilge pump and its system were not tested. Comments: The fuel system including the tanks, fill, vent, feed and return lines was visually inspected as installed. Where visible the fuel system components are in satisfactory condition. Several of the Racors’ filter bowls are difficult to see through. There is fuel on a fitting at the port generator’s Racor filter and there is fuel on an absorbent rag below this filter. The condition and age of the fuel (and water) and the integrity of the tanks (fuel, water and holding) is beyond the scope of this survey. Please consider filling all tanks for a simple, practical test of their integrity. The water pressure system functioned normally. There is rust on the inboard forward bottom edge of the starboard waste tank. Comments: The electrical system including the shore power cord, batteries, wiring, circuitry components and circuit protection equipment was visually inspected and most components were tested. The shore power cord was not disconnected from the vessel and the inlet was not inspected. The connectors on the shore power cord were not inspected. Overall the electrical system is in good condition. The condition of the batteries is beyond the scope of this inspection. Several of the batteries’ terminals use wing nuts. The batteries located in the engine room entryway, behind the generator control panel, are not utilizing their straps or covers. Comments: Safety equipment for fire fighting protection appears satisfactory, however not all of the extinguishers have been inspected, tagged and maintained per N.F.P.A. recommendations and USCG requirements. Personal flotation devices appear good for near coastal use. Current distress signal flares are aboard. A suitable sound signaling device is aboard, it was not tested. The navigational and anchor lights are properly arranged and installed. They were not tested. The ground tackle including the anchor and rode was visually inspected as installed and appears satisfactory. There is a heavy lid for the anchor locker. There is no means to secure the lid in the open position. There is no windlass. There is no secondary anchor or rode aboard. The shut down hampers for the various vents were not tested and the engine room vents exhibit rust. We did not count or inspect all personal floatation devices. We noted three fire hoses during the survey, the flybridge fire hose is labeled station 4. The fire fighting system was not tested. The anchor and anchor rode was not inspected and should be inspected prior to use. 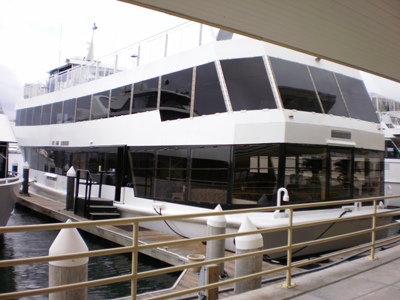 The vessel is a steel, 3-deck, passenger carrying (event hosting) commercial vessel. The vessel is equipped with two diesel engines and two diesel generators. We did not discuss the ownership or maintenance history with the operators. The vessel is set up for hosting charters. The Certificate of Inspection lists 350 passengers and requires one master, one mate and four deckhands. The vessel is limited to no more than one mile offshore and the expiry date on the COI is 04 Oct. 2011. The vessel has been extended by the transom. The vessel has a small commercial kitchen. The vessel has an enclosed pilot house located forward on the flybridge. The main and second decks are completely enclosed, with no walk around exterior decks. There is a small exterior foredeck forward on the second deck level. The flybridge is open with one set of steps between the flybridge and the second deck and two sets of steps between the main deck and the second deck. The vessel was not hauled or taken on a sea trial. Stability is beyond the scope of this survey. The vessel appears basically structurally and mechanically sound and suitable for its intended purpose as a passenger carrying commercial vessel. The actual cash value is the value that our research approximates the selling price of this vessel should be, at the time and place of our inspection. Consideration is given to vessel’s condition, geographic location, published listings and guides, comparable sales and listings, and market conditions. The new replacement value is the cost of this or a similar, new vessel, comparably equipped. The investment is the reported investment including purchase price and significant upgrades. No values include maintenance costs, storage or tax. The value includes consideration for the C.O.I. but not the value of the business or income. 1. Provide and install the nuts missing on the various windows’ bolts. 2. Display the hailing port on the transom per federal regulations. 3. Display the hull identification number per federal regulations. 4. Determine the significance of the missing or loose fasteners for the tank cover located forward of the starboard generator, provide and install fasteners as needed, tighten loose fasteners as needed. 5. The vessel is currently set up for use in calm (harbor, no wake) conditions. Many items are not secure and would move or fall in a sea way with waves or significant wakes. Among items which should be secure prior to any use in conditions with wakes or waves are: engine room tool box, buckets of oil in the engine room, galley range, CO2 bottles for the beverage dispensing system, loose furnishings, unused tables and other items stored on top of the pilot house hard top. 6. Remove the water from the bilge in the steering space and the waste tank bilge area. Service to eliminate any water leak(s). 7. Properly secure any deck hatches and provide a tool which is easily accessible for opening the hatches as needed. 8. Secure the loose steel cover for the crawl space to port forward on the flybridge. 9. Service to eliminate the water leak at the HVAC water pump to starboard in the engine room. Clean rust stains to allow detection of any future leaks or weeps. 10. Service to eliminate the source of the soot to starboard aft and overhead in the engine room. Clean soot to allow detection of any future exhaust leaks or any other cause of the soot. 11. Service to eliminate the excessive water leak at the starboard rudder port. 12. Replace all wing nuts on batteries with steel nuts and lock washers. 13. Service to eliminate the source of fuel on a fuel hose fitting near the port generator’s Racor filter. Clean all spilled fuel and replace the absorbent rag to allow detection of any future fuel leaks. 14. Maintain the portable fire extinguishers per N.F.P.A. recommendations and U.S.C.G. requirements. Several extinguishers were tagged and inspected in October ’09, one was tagged and inspected in September ’08 and one was tagged and inspected in September ’03. 15. Service and prove the engine room vent shutdown system is properly functional, many of the components exhibit rust. Clean and paint as needed. 16. We strongly encourage upgrading the ground tackle system to allow a means of deploying the anchor easily and quickly if necessary. Provide a secondary anchor and rode. If the vessel is to be anchored the system should be upgraded to include a windlass and access to the stern cleat. 1. Determine the significance of the rust and corrosion inboard forward on the bottom edge of the starboard waste tank. Address the corrosion as necessary. Eliminate any cause of the corrosion. Prep and paint to prevent further corrosion. 2. Service the Racor fuel filter bowls as necessary to allow the sight bowls to function as designed. Several bowls are difficult to see through. 3. Install the covers and straps on the batteries located in the engine room entryway, behind the generator control panel to prevent accidental upset or movement and to reduce potential for accidental short circuiting. 4. Eliminate any oil leaks at the generator, clean oil from about the generators to allow detection of any future leaks. 5. Maintain propeller shaft seals, they are leaking water slightly more than normal. 6. Service as the result of corrosion on the water fitting above the starboard transmission. 7. Clean the water and oil from the engine room bilge. Service as necessary to eliminate any leaks. 8. Monitor the cracks in the windows forward on the main deck. The two forward windows are cracked, the third and fifth port side windows from the bow are cracked and the third window from the bow on the starboard side may be cracked. Replace these components if/as needed. 9. Assure there is no significance in not using the tank located in the bilge space, just forward of the galley. Reuse the tank if/as necessary for stability.